The Ecologist reports, 12th October 2014: “Sharks are already in trouble everywhere. They are pursued as food or feared as a threat, and the habitat they favour is gradually being degraded or destroyed. Human emissions of carbon dioxide do more than just warm the global climate. They also acidify our seas and oceans. And sharks — ocean-going creatures that have survived 420 million years of natural climate change – could be at risk from increasingly acidic seas in coming decades, according to two entirely different scientific studies. 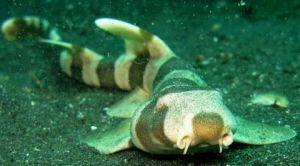 Bamboo Shark in Indonesia’s Lembeh Straits. With high levels of CO2, the species’ survival is reduced by 40%. Photo: Steve Childs via Flickr. Danielle Dixson, a marine conservation biologist at the Georgia Institute of Technology in the US, and colleagues report in Global Change Biology that changes in the pH value of water — in other words, as the seas became more acidic — have interfered with a shark’s ability to smell food. She experimented with a shark known as the smooth dogfish (Mustelus canis), which is found in the Atlantic waters off the US coast. She tested 24 sharks in a 10-metre tank with two currents or plumes of water. One was normal sea water, and the other was rich in the odour of squid. As expected, the sharks showed a distinct preference for the smell of food. With more CO2, sharks are less able to smell squid Then she and her colleagues enriched the water with carbon dioxide — to levels predicted for mid-century as greenhouse emissions continue to rise, and the seas become more rich in carbonic acid. When released into the most acidic water, the sharks actually avoided the plume of squid odour. Once again, the change in the water’s pH seemed to have disrupted an all-important receptor, and thus the sharks’ interest in hunting. In a second paper, this time in the Proceedings of the Royal Society, Rui Rosa, senior researcher at the Centre for Oceanography in Cascais, Portugal, and colleagues considered the impact of warmer and more acidic seas on the survival of the newly-hatched tropical bamboo shark (Chiloscyllium punctatum), normally found in the intertidal zones of the western Pacific. The researchers tested hatchlings in tanks at temperatures and pH values predicted for 2100, and found “significant impairment” in survival rates. In their experiments at normal temperature conditions, mortality among the hatchlings was zero. In experimental conditions, behaviour changes were apparent from the outset and, within 30 days, more than 40% had died.